Polymicrobial sepsis induces organ failure and is accompanied by overwhelming inflammatory response and impairment of microbial killing. Peroxisome proliferator-activated receptor (PPAR)-γ is a nuclear receptor with pleiotropic effects on lipid metabolism, inflammation, and cell proliferation. The insulin-sensitizing drugs thiazolidinediones (TZDs) are specific PPAR-γ agonists. TZDs exert anti-inflammatory actions in different disease models, including polymicrobial sepsis. The TZD pioglitazone, which has been approved by the U.S. Food and Drug Administration, improves sepsis outcome; however, the molecular programs that mediate its effect have not been determined. In a murine model of sepsis, we now show that pioglitazone treatment improves microbial clearance and enhances neutrophil recruitment to the site of infection. We also observed reduced proinflammatory cytokine production and high IL-10 levels in pioglitazone-treated mice. These effects were associated with a decrease in STAT-1–dependent expression of MyD88 in vivo and in vitro. IL-10R blockage abolished PPAR-γ–mediated inhibition of MyD88 expression. These data demonstrate that the primary mechanism by which pioglitazone protects against polymicrobial sepsis is through the impairment of MyD88 responses. This appears to represent a novel regulatory program. In this regard, pioglitazone provides advantages as a therapeutic tool, because it improves different aspects of host defense during sepsis, ultimately enhancing survival. The overwhelming production of systemic inflammatory mediators is a key feature in severe sepsis and is commonly associated with organ dysfunction and death (1). MyD88, an essential adaptor protein in the TLR/IL-1R1–signaling pathway, plays an important role in the production of inflammatory mediators during sepsis. Myd88-deficient mice fail to produce high levels of IL-6, CXCL1, and CXCL2 during cecal ligation and puncture (CLP)-induced sepsis (2). Therefore, it should be possible to reduce systemic inflammation by modulating MyD88 expression or activity. The expression of MyD88 was shown to be upregulated by LPS and inflammatory mediators, such as TNF-α and IFN-γ (3), and downregulated by IL-10 (4). Moreover, we demonstrated previously that leukotriene B4 also induces MyD88 expression in a STAT-1–dependent manner (5). Thiazolidinediones (TZDs) are potent insulin-sensitizing drugs that function via activation of the nuclear receptor peroxisome proliferator-activated receptor (PPAR)-γ. Pioglitazone is a TZD approved by the U.S. Food and Drug Administration that is used for type 2 diabetes treatment. Rosiglitazone and troglitazone also show potent insulin-sensitizing properties, but they were removed from the market because of undesired side effects (6). In addition to the glucose control, the activation of PPAR-γ by TZDs is involved in the modulation of atherosclerosis, adipocyte proliferation, and inflammation (7). Indeed, natural and synthetic PPAR-γ ligands have been tested in experimental models of sepsis because of their known anti-inflammatory effects. Data show that treatment with TZDs and natural ligands for PPAR-γ reduces the release of IL-6, IL-10, TNF-α, and CCL2, as well as the neutrophil infiltration in lung and liver induced by polymicrobial sepsis or endotoxemia (8, 9). In addition, treatment of endotoxemic mice with PPAR-γ agonists reduces levels of high mobility group box 1 and markers for organ dysfunction. As a consequence, survival of mice is increased significantly by those treatments (8, 10–12). However, the mechanism for the anti-inflammatory effects of PPAR-γ agonists is not fully understood. A well-accepted hypothesis is that activated PPAR-γ directly interacts with a transcription factor, resulting in its transrepression (13). Indeed, the synthetic PPAR-γ agonist ciglitizone reduces IKK activity and IκB degradation induced by hemorrhagic shock (9). Along these lines, the natural PPAR-γ agonist 15-deoxy-Δ12,14-PGJ2 (15d-PGJ2) reduces IFN-α– and IFN-γ–induced STAT-1 phosphorylation in different cell types (14). The aim of this study was to determine whether PPAR-γ impairs STAT-1 activation, thereby reducing STAT-1–dependent MyD88 expression during CLP-induced sepsis. We found that treatment with pioglitazone, a synthetic agonist of PPAR-γ, inhibited STAT-1 phosphorylation in an IL-10R–dependent manner, leading to a reduction in MyD88 expression in peritoneal cells. Pioglitazone treatment increased neutrophil migration to the peritoneal cavity, culminating in reduced bacterial load and a reduced systemic inflammatory response during CLP-induced sepsis. Female C57BL/6 mice (8 wk old, weight 18–23 g) were obtained from The Jackson Laboratory (Bar Harbor, ME). Doxycycline-controlled dnPPAR-γ–transgenic mice were bred at Indiana University School of Medicine (15). Mice were maintained according to National Institutes of Health guidelines for the use of experimental animals with the approval of the Indiana University Committees for the Use and Care of Animals. Sepsis was induced by CLP, as previously described (16), using a 26G or 18G needle to induce moderate or lethal sepsis, respectively. A group of mice was treated i.p. with pioglitazone (20 mg/kg; Cayman Chemical) 18 h before CLP surgery. Survival was monitored every 12 h for 7 d after CLP surgery; mice showing signs of imminent death (inability to maintain upright position/ataxia/tremor and/or agonal breathing) were euthanized. For other protocols, mice were euthanized 6 h after CLP surgery. For in vivo experiments, pioglitazone (20 mg/kg, i.p) was administered 1, 4, and 18 h before CLP surgery. For in vitro experiments, pioglitazone, rosiglitazone, troglitazone, and GW9662 (10 μM each; Cayman Chemical) were incubated with 2 × 106 cells for 24 h before immunoblotting or PCR assays. Anti–IL-10R blocking Ab (BioLegend; 20 μg/ml) was incubated for 0.5 h before pioglitazone and/or stimulation with 100 ng/ml LPS (Sigma-Aldrich). Elicited macrophages were harvested from the peritoneal cavities of mice by lavage with PBS 4 d after the injection of 2 ml 3% thioglycollate, as described previously (17). Blood was collected from the orbital plexus of mice, and the peritoneal cavity was washed with PBS. Aliquots of serial log dilutions were plated in Mueller–Hinton agar dishes, as previously described (18). Leukocyte numbers were determined in the peritoneal cavity and bronchoalveolar lavage fluid 6 h after CLP or sham surgery using the Hemavet 950FS System. Peritoneal cells were resuspended in PBS containing 2 mM EDTA and 0.5% FCS. FcR-mediated and nonspecific Ab binding was blocked by addition of excess CD16/CD32 (clone 2.4G2; BD Biosciences Pharmingen) for 10 min at 4°C. The cells were stained with mouse anti-GR1 FITC (1:100; BD Biosciences Pharmingen) for 30 min at 4°C, and the expression of this receptor was analyzed by flow cytometry (FACSCalibur). Data were analyzed with WinMDi and FlowJo Version 7.6.4 software. TNF-α, IL-10, IL-1β, and IL-6 were measured using DuoSet ELISA (R&D Systems), following the manufacturer’s protocol. PPAR-γ DNA-binding activity in nuclear extracts (10 μg protein) was assayed using a PPAR-γ Transcription Factor Assay Kit (Cayman Chemical). For in vivo PPAR-γ activity, C57BL/6 mice were treated or not with pioglitazone (20 mg/kg, i.p) for 4 or 24 h, and peritoneal cells were isolated. For in vitro activity assay, wild-type (WT) macrophages were stimulated for 1, 4, or 24 h with 10 μM pioglitazone. Mice were perfused with 10% formalin before lung harvesting. The tissues were fixed in 10% formalin, embedded in paraffin, cut into 5-μm sections, and stained with H&E, as previously described (19). The images were recorded using an Infinity 1 camera attached to a Nikon Eclipse Ci microscope. Capillary congestion, alveolar edema, and PMN infiltration were determined as previously described (19). Western blots were performed as previously described (5, 17). Protein samples were resolved by SDS-PAGE, transferred to a nitrocellulose membrane, and probed with primary Abs against MyD88, total or phosphorylated (S727 or Y701) STAT-1, phosphorylated JAK2 (Tyr1007/1008) (all at 1:1,000; Cell Signaling), or β-actin (1:10,000; Sigma-Aldrich). Densitometric analysis was performed as described previously (5, 17). Total RNA from cultured cells was isolated using the Gene mammalian Total RNA Miniprep Kit (Sigma-Aldrich), according to the manufacturer’s instructions. Real-time RT-PCR was performed as previously described (5, 17). The sequences for the primers Ppar-γ, Ppar-α, Ppar-δ, Myd88, Stat1, and Actin (all from Integrated DNA Technologies) are listed in Table I. Relative expression was calculated using the comparative threshold cycle (Ct) and expressed relative to control or WT (ΔΔCt method). Nuclear and cytoplasmic fractions of peritoneal cells from naive, sham, or septic mice, which were treated or not with pioglitazone, were isolated as previously described (5) using a subcellular protein fractionation kit, according to the manufacturer’s instructions (Pierce). Survival curves are expressed as percentage survival and were analyzed using a log-rank (Mantel–Cox) test. Bacterial load results are expressed as median. Other results are expressed as mean ± SEM and were analyzed by ANOVA, followed by Bonferroni analysis. Differences were considered significant for p < 0.05. PPAR-γ activation inhibits activation of TLR and NF-κB, which are essential components involved in the control of polymicrobial sepsis (20, 21). It was shown that PPAR-γ activation protects mice against endotoxic shock and polymicrobial sepsis (12, 22–25). Using the CLP model, we investigated whether PPAR-γ activation exerts different effects in vivo depending on the severity of polymicrobial sepsis. Treatment of mice with pioglitazone (20 mg/kg) for 1 or 4 h before CLP did not have any effect on survival in animals with moderate or severe sepsis (Supplemental Fig. 1). When mice were treated with pioglitazone for 18 h before CLP, we observed a significant increase in the survival of severely septic mice but no effect on the survival of moderately septic mice (Fig. 1A). The same protective effect was observed in rosiglitazone-treated mice (data not shown). We found that pioglitazone treatment substantially decreased bacterial load in severely septic mice in both the peritoneal cavity (Fig. 1B) and blood (Fig. 1C). We observed the same pattern when mice were treated with pioglitazone, followed by induction of moderate sepsis (data not shown). To determine whether expression of other classes of PPAR (Table I) was increased following pioglitazone treatment of septic animals, we performed real time quantitative PCR (qPCR) analysis of peritoneal cells harvested 6 h after CLP (Table 1). PPAR-γ was the most abundantly expressed PPAR during sepsis, although PPAR-α also was elevated significantly, albeit to a much lesser extent (Fig. 1D). The increased PPAR-γ expression during CLP was confirmed by immunoblotting (Fig. 1E). Thus, activation of PPAR-γ by pioglitazone treatment results in further expression of PPAR-γ in septic animals. From a translational perspective, these data demonstrate that prolonged PPAR-γ activation enhances survival of severely septic mice, and survival was associated with reduced bacterial load at the site of infection and in the blood. Pioglitazone treatment enhances animal survival and microbial clearance in polymicrobial sepsis. (A) Survival rates of C57BL/6 mice (n = 10/group) treated with 20 mg/kg pioglitazone for 18 h before severe or moderate CLP-induced sepsis. The survival rate was determined every 12 h for up to 7 d after surgery. CFU in peritoneal cavity (B) or blood (C) 6 h after CLP in C57BL/6 mice treated or not with pioglitazone 18 h prior to CLP. (D) Pparg, Ppard ,and Ppara mRNA expression in peritoneal cells 6 h after CLP or sham surgery, determined by qPCR, as described in Materials and Methods. (E) PPAR-γ or actin protein expression detected by immunoblotting of peritoneal cells harvested 6 h after CLP or sham surgery. Numbers under lanes indicate the relative density of PPAR-γ determined from densitometric analysis and expressed as the mean ± SEM from three individual experiments. Values for the WT control group were set as 100%. Data are expressed as mean ± SEM from at least three independent experiments. *p < 0.05 relative to the sham group or CLP versus pioglitazone treatment. n.d., not detected. We (26–28) showed that neutrophils are key cells involved in the control of polymicrobial sepsis. We (27, 29) also showed that high mortality in severe sepsis is a consequence of impaired neutrophil migration to the site of infection, although neutrophils and cytokines accumulate in other target organs. We speculated that PPAR-γ activation could prevent neutrophil migration failure to the peritoneal cavity during severe sepsis, leading to enhanced microbial clearance. Our results showed a decrease in the neutrophil numbers in the peritoneal cavity 6 h after severe sepsis, and PPAR-γ activation prevented neutrophil migration failure to the infectious site (Fig. 2A, 2B). The same pattern also was observed in monocyte recruitment (data not shown). PPAR-γ enhances neutrophil recruitment to the site of infection and decreases proinflammatory cytokine production. (A) C57BL/6 were pretreated or not with pioglitazone for 18 h and subjected to severe CLP or sham; peritoneal neutrophil numbers were determined 6 h later, using Hemavet, as described in Materials and Methods. (B) Mice were treated as in (A), and the number of GR1+ cells was determined by FACS. (C) C57BL/6 mice were treated as in (A), followed by determination of the level of TNF-α, IL-6, IL-1β, or IL-10 in the peritoneal lavage fluid by ELISA. (D) Mice were treated as in (A), and serum was harvested 6 h after CLP for detection of TNF-α, IL-6, IL-1β, and IL-10 by ELISA. Data are mean ± SEM. *p < 0.05, versus sham group, #p < 0.05 pioglitazone-treated mice versus untreated mice. n.d., not detected. An overwhelming inflammatory response due to cytokine storm is a major cause of organ dysfunction and death in septic patients (30, 31). We determined whether pioglitazone treatment would inhibit the production of proinflammatory cytokines TNF-α, IL-6, and IL-1β in septic animals. Levels of TNF-α and IL-1β in both peritoneal cavity and blood were reduced in pioglitazone-treated septic mice compared with untreated septic mice (Fig. 2C, 2D). IL-6 levels were decreased in the blood but not in the peritoneal cavity (Fig. 2C, 2D). In contrast, levels of the anti-inflammatory cytokine ΙL-10 were greatly enhanced in both the peritoneal cavity and blood of pioglitazone-treated septic mice (Fig. 2C, 2D). These data suggest that pioglitazone improves mouse survival by enhancing bacterial clearance, increasing neutrophil recruitment, and favoring an anti-inflammatory milieu at the site of infection. One of the major consequences of sepsis is the development of lung injury (27). Therefore, one possible mechanism by which PPAR-γ improves animal survival is through decreasing the inflammatory response in the lung. Indeed, we observed that pioglitazone treatment inhibited the accumulation of neutrophils in lungs of septic mice (Fig. 3A). We did not observe significant changes in monocyte or lymphocyte numbers (Fig. 3A). The effect of pioglitazone-mediated protection in the lung pathology was confirmed by examination of lung sections. Pioglitazone treatment decreased leukocyte recruitment to the lung and decreased alveolar edema and capillary congestion (Fig. 3B, 3C). We also detected the presence of pro- and anti-inflammatory cytokines in the bronchoalveolar lavage fluid of mice treated with pioglitazone (Fig. 3D). The data show that pioglitazone treatment resulted in decreased levels of TNF-α and IL-1β, but it dramatically increased the levels of IL-10. In addition to improving the control of microbial burden at the site of infection, PPAR-γ activation ameliorates lung injury, an important event associated with mortality in sepsis (32–34). Pioglitazone treatment decreases inflammatory response in the lung. (A) Leukocyte recruitment (neutrophil, monocytes, and lymphocytes) in C57BL/6 mice treated or not with pioglitazone for 18 h, followed by CLP. Leukocytes present in the bronchoalveolar lavage fluid (neutrophils, monocytes, and lymphocytes) were determined using Hemavet, 6 h after CLP surgery. (B) Histological sections stained with H&E from mice treated as in (A). Original magnification ×100. (C) Lung histology scores (alveolar edema, capillary congestion, and PMN infiltration) were determined as described in Materials and Methods. (D) Cytokine concentrations in bronchoalveolar lavage fluid (IL-1β, TNF-α, and IL-10) were determined by ELISA. n = 6–8 in each group. Data are mean ± SEM. *p < 0.05, versus sham group, #p < 0.05, pioglitazone-treated mice versus untreated mice. We hypothesized that prolonged PPAR-γ activation inhibits inflammatory responses in sepsis by inhibiting the expression of TLRs or the Toll–IL-1R (TIR) adaptor MyD88, which is essential for TLR and IL-1β receptor responsiveness (35, 36). Our data show that MyD88 expression was decreased in peritoneal macrophages treated with different PPAR-γ agonists (Fig. 4A). Pioglitazone and rosiglitazone were more potent than troglitazone in inhibiting MyD88 expression in macrophages. Endogenous PPAR-γ did not inhibit MyD88 expression in macrophages from PPAR-γ DN and from WT macrophages treated with GW9662 (data not shown). Pioglitazone treatment decreased MyD88, but not TLR4 expression in monocyte-derived human macrophages (Fig. 4B). Next, we investigated whether the time of PPAR-γ activation correlates with the decrease in MyD88 expression in vivo and in vitro. Our results show that pioglitazone enhances PPAR-γ activation 4 h after treatment in vitro and peaks after 24 h both in vivo and in vitro (Fig. 4C, 4D). We only observed a decrease in MyD88 levels 24 h after pioglitazone treatment in vivo and in vitro (Fig. 4C, 4D). These data further suggest that pioglitazone-induced PPAR activation leads to decreased MyD88 levels. We also confirmed that pioglitazone effects are restricted to PPAR-γ activation. Macrophages were pretreated with the PPAR-γ receptor antagonist GW9662, followed by challenge with pioglitazone for 24 h. We did not see any changes in MyD88 expression when macrophages were treated with GW9662 (Supplemental Fig. 2). We then investigated whether pioglitazone inhibited MyD88 expression during sepsis in vivo. MyD88 expression was increased 6 h after CLP at both the mRNA level (Fig. 4E) and protein level (Fig. 4F, 4G), and treatment with pioglitazone significantly decreased MyD88 levels in these mice (Fig. 4E–G). Activation of PPAR-γ inhibited MyD88 specifically but did not affect TLR4 expression (Fig. 4F) or the TLR adaptor TRIF (data not shown). These data indicate that PPAR-γ activation provides an endogenous brake involved in both homeostatic and inducible MyD88 expression in vitro and in vivo. PPAR-γ inhibits expression of MyD88 in vitro and in vivo. (A) Peritoneal macrophages were treated with 10 μM of PPAR-γ agonists (rosiglitazone, pioglitazone, troglitazone) for 24 h, followed by the determination of MyD88 and actin expression by qPCR, as described in Materials and Methods. (B) Monocyte-derived human macrophages were treated with pioglitazone for 24 h and subjected to immunoblot for MyD88, TLR4, and actin. Numbers under lanes indicate the relative density of PPAR-γ, determined from densitometric analysis and expressed as the mean ± SEM from three individual experiments, with the values of the untreated group set as 100% control. (C) Macrophages were treated with pioglitazone for the indicated times, and the expression of Myd88 and actin mRNA was determined by qPCR, and PPAR-γ activity was determined as described in Materials and Methods. (D) C57BL/6 mice (n = 3/time point) were treated with 20 mg/kg pioglitazone via i.p. injection, the expression of Myd88 and actin mRNA was determined by qPCR, and PPAR-γ activity was determined in the peritoneal cells, as described in Materials and Methods. (E–G) C57BL/6 mice were treated with pioglitazone for 18 h, followed by CLP surgery. Peritoneal cells from three mice were harvested 6 h after induction of sepsis, lysed, and subjected to qPCR (E) or immunoblotting (F) for determination of MyD88, TLR4, and actin. (G) Densitometric analysis of the bands shown in (D). Data are mean ± SEM. *p < 0.01, versus sham group or control group, #p < 0.01, pioglitazone-treated mice versus untreated mice. We (37) showed previously that STAT-1 is the major transcription factor responsible for MyD88 expression. We (37) also showed that suppressor of cytokine signaling (SOCS)-1 inhibits MyD88 levels by preventing STAT-1 activation. We hypothesize that PPAR-γ inhibits MyD88 expression by preventing STAT-1 activation. Initially, we investigated whether PPAR-γ activation alters STAT-1 expression. No changes in STAT-1 mRNA expression were observed when macrophages were treated with pioglitazone, rosiglitazone, troglitazone (Fig. 5A), or the PPAR-γ antagonist GW9662 (data not shown). Furthermore, we did not observe any changes in Stat1 mRNA levels in macrophages from PPAR-γ receptor DN mice (data not shown). In vivo experiments showed that, although STAT-1 expression was increased after sepsis, pioglitazone did not affect STAT-1 levels in vivo (Fig. 5B). Because no changes in STAT-1 expression were observed, we speculated that PPAR-γ might alter phosphorylation of STAT-1 at the residue important for DNA binding activity (Y701) or at the site required for maximal transcriptional activity (S727) (38–40). Phosphorylated Y701 was not detected under any conditions tested (data not shown), but we found that peritoneal cells from septic mice exhibited higher STAT-1 S727 phosphorylation than did peritoneal cells from sham mice (Fig. 5C). Moreover, pioglitazone treatment in vivo inhibited STAT-1 S727 phosphorylation compared with septic mice (Fig. 5C). Because SOCS-1 inhibits JAK/STAT-1 activation, we sought to determine the levels of SOCS-1 in pioglitazone-treated mice during sepsis. No differences in SOCS-1 expression were detected in any group tested (data not shown). Furthermore, the decrease in STAT-1 phosphorylation was not dependent on JAK-2 phosphorylation (Fig. 5D). Although sepsis increased JAK-2 phosphorylation, pioglitazone treatment did not decrease JAK-2 phosphorylation (Fig. 5D). To further investigate the molecular programs involved in PPAR-γ-mediated STAT-1 action, we investigated whether PPAR-γ activation influenced STAT-1 nuclear translocation in vivo. Peritoneal cells from septic mice exhibited enhanced STAT-1 nuclear translocation, an event prevented by PPAR-γ activation (Fig. 5E). These data suggest that PPAR-γ activation decreases MyD88 expression by preventing two important steps involved in STAT-1 activation: serine phosphorylation and nuclear translocation. PPAR-γ inhibits STAT-1 nuclear translocation and transcriptional activity. (A) Peritoneal macrophages were treated with 10 μM of PPAR-γ agonists (rosiglitazone, pioglitazone, troglitazone) for 24 h, followed by determination of STAT-1 and actin expression by qPCR, as described in Materials and Methods. (B–E) C57BL/6 mice were treated or not with pioglitazone for 18 h followed by CLP surgery. Peritoneal cells were harvested 6 h after sepsis induction, lysed, and subjected to qPCR for determination of STAT-1 expression and immunoblotting for determination of total STAT-1, STAT1 pS727 (D), or JAK2, laminin, and actin (E). The numbers underneath the bands represent mean densitometric analysis of the bands shown. Data are mean ± SEM. *p < 0.01, versus sham group, #p < 0.01, pioglitazone-treated mice versus untreated mice. Because we (41–44) previously observed that pioglitazone treatment greatly enhances IL-10 levels in vitro and in vivo, coupled with the fact that IL-10 decreases MyD88 expression (4, 45), we speculated that IL-10 mediates PPAR-γ’s effects on MyD88 levels. We determined whether pioglitazone enhanced IL-10 production and whether it further enhanced LPS-induced IL-10 levels in thioglycollate-elicited macrophages. We found that pioglitazone significantly enhanced IL-10 production in elicited macrophages and amplified LPS-induced IL-10 levels (Fig. 6A). To investigate whether enhanced IL-10 in pioglitazone-treated cells accounted for inhibition of MyD88, macrophages were pretreated with anti–IL-10R Ab, followed by pioglitazone and LPS treatment for 24 h. Pioglitazone inhibited LPS actions (Fig. 6B). However, when cells were pretreated with anti–IL-10R, we observed an enhancement of MyD88 levels that occurred even in the presence of pioglitazone (Fig. 6B). We further investigated whether blocking IL-10 actions also would prevent PPAR-γ inhibition of STAT-1 activation. As we observed during CLP, macrophage treatment with pioglitazone decreased LPS-induced STAT-1 S727 phosphorylation but not STAT-1 Y701 phosphorylation, an event mediated by endogenous IL-10 actions (Fig. 6B). These results are consistent with the existence of a novel regulatory program in which PPAR-γ activation enhances IL-10 levels to decrease STAT-1–dependent MyD88 expression, which further inhibits TIR-dependent macrophage activation and improves animal survival during sepsis (Fig. 6C). IL-10 mediates PPAR-γ inhibition of STAT-1–dependent MyD88 expression. (A) Thioglycollate-elicited peritoneal macrophages were treated or not with pioglitazone for 18 h, followed by LPS stimulation for 24 h. IL-10 in the supernatant was measured by ELISA. Data are mean ± SEM. *p < 0.05, versus untreated cells, #p < 0.05, versus LPS challenged. (B) Cells were treated with anti–IL-10R (20 μg/ml) for 0.5 h before the addition of 10 μM pioglitazone for 24 h and before LPS stimulation for another 24 h. Cell lysates were subjected to immunoblotting for MyD88, STAT-1 pS727, STAT-1 pY701, and actin. The numbers underneath the bands represent mean densitometric analysis of the bands shown. Data are representative of two independent experiments. (C) Proposed model of PPAR-γ regulation of IL-10 and MyD88 expression and enhancement of animal survival after CLP procedure. This study demonstrates the therapeutic potential of the PPAR-γ ligand pioglitazone in the most widely used models of sepsis and septic shock, which resemble human sepsis in many respects (31, 46, 47). Specifically, we demonstrate that prolonged PPAR-γ activation protects mice against severe CLP-induced sepsis by ameliorating important steps in the pathogenesis of sepsis that lead to increased survival, including restoring neutrophil recruitment to the site of infection, increasing bacterial clearance at the site of infection and in blood, decreasing the cytokine storm, and inhibiting MyD88 expression and, therefore, the actions of TIR domains, such as members of the IL-1R and TLR superfamily. Importantly, these results suggest a novel PPAR-γ/IL-10 network that inhibits MyD88 levels in macrophages that dampen the systemic inflammatory response. Most PPAR-γ agonists belong to the TZD family (6, 48). These compounds are used in the treatment of type 2 diabetes and some cardiovascular complications. Because pioglitazone is approved by the U.S. Food and Drug Administration for the treatment of type 2 diabetes, we decided to use only this drug in our study. Rosiglitazone and pioglitazone have been beneficial in treating various kidney injuries, including nephropathy resulting from diabetes, hypertension, and cyclosporine-induced renal injury (6); however the consequences of chronic TZD intake on host defense systems remain to be determined. It is well established that PPAR-γ activation decreases inflammatory responses in different disease models (6, 13, 25). In the CLP model, PPAR-γ activation improves animal survival, and the mechanisms underlying animal protection are diverse (25). Zingarelli et al. (8) showed that 15d-PGJ2 and ciglitizone protect rats against polymicrobial sepsis by inhibiting activation of two inflammatory transcription factors, NF-κB and AP-1, and by improving hemodynamic performance. Furthermore, 15d-PGJ2 treatment also improve renal, liver, and pancreatic function in LPS-challenged mice (10). PPAR-γ activation also inhibits the expression/activation of different inflammatory mediators involved in the pathogenesis of sepsis, including reactive oxygen and nitrogen intermediates, gelatinase B, and cyclooxygenase 2 (25, 49). We also observed that pioglitazone treatment decreases the generation of proinflammatory cytokines responsible for the cytokine storm, such as IL-1β, TNF-α, and IL-6. These cytokines are involved in the infiltration of neutrophils, leading to tissue necrosis and favoring an overwhelming inflammatory response (27, 29). We did not observe any effect of endogenous PPAR-γ activation in the control of sepsis, because treatment of mice with the PPAR-γ antagonist before severe CLP did not alter animal survival or bacterial load (data not shown). Other laboratories (24, 49, 50) reported that PPAR-γ–antagonist or PPAR-γ–deficient mice are protected from CLP, which is somewhat contradictory to our findings. The reasons for such a discrepancy may include severity of the CLP, time of treatment, mouse strain, and species differences (rat versus mice). An important finding in our study is that, in addition to improving local inflammatory responses, pioglitazone prevented acute lung injury in septic mice. This amplified response, also called the cytokine storm, results in systemic inflammation that affects several organs, including lungs (51). The lung is particularly affected, and acute lung injury secondary to sepsis is characterized by edema, inflammatory cell infiltration, and impaired gas exchange that can lead to multiorgan failure (30, 52). 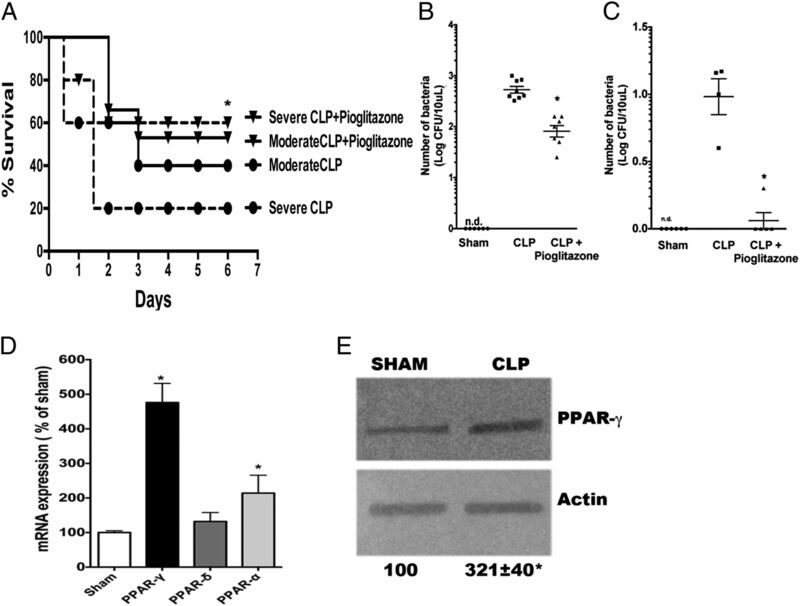 PPAR-γ activation inhibited CLP-induced edema formation and neutrophil recruitment to the lung and inhibited cytokine production favoring leukocyte activation. Our findings are in agreement with studies (9, 53) that reported that PPAR-γ activation decreases neutrophil sequestration in lung and the production of proinflammatory cytokines. We previously demonstrated the involvement of TLRs in the production of inflammatory cytokines and the systemic activation of neutrophils in sepsis. Mice lacking TLR2, TLR4, or TLR9 show attenuated systemic inflammatory responses and reduced mortality under polymicrobial sepsis (24, 26, 28, 54). These effects were due to enhanced bacterial load control in the knockout mice as a consequence of the reduced systemic activation of neutrophils and increased recruitment of these cells to the infection site (24, 26, 28, 54). Based on that, we speculate that the overwhelming inflammatory response triggered by the recognition of diverse ligands to specific TLRs in polymicrobial sepsis can be modulated by the partial abrogation of TLR signaling. In this study, we demonstrate that pioglitazone and other TZDs specifically decrease mRNA and protein levels of MyD88, the main adaptor protein of TLRs, in both naive macrophages and cells from septic mice. Therefore, it can be suggested that a pioglitazone-induced decrease in MyD88 expression dampens the excessive TLR signaling, improving the outcome of polymicrobial sepsis. MyD88 expression is controlled by different transcription factors, including NF-κB (55), IL-6–responsive elements (56), and STAT-1 (37). We speculated that PPAR-γ activation would decrease STAT-1 activation, leading to inhibition of MyD88 levels. PPAR-γ inhibition of STAT-1 DNA-binding activity in IFN-α– and IFN-β–activated cells was reported (57, 58). However, PPAR-γ inhibition of STAT-1 activity in vivo and in a sepsis model or in LPS-stimulated macrophages remains to be determined. Our data show that PPAR-γ activation impairs both upstream effects of STAT-1, such as nuclear translocation, and phosphorylation of STAT-1 on the S727 residue, which is required for optimal transcriptional activity (59). The intracellular molecular programs involved in PPAR-γ regulation of different steps involved in STAT-1 activation remain to be investigated. PPAR-γ activation elicits numerous anti-inflammatory programs by impairing the activation of different transcription factors, such as NF-κB, AP-1, and STAT-1, through the sequestration of essential, shared coactivators (13). SOCS-1 is a well-known STAT-1 inhibitor (60, 61). We did not detect any changes in SOCS-1 levels when mice or cells were treated with pioglitazone (data not shown). Park et al. (57) showed that rosiglitazone and 15d-PGJ2 inhibit activation of JAK2 and STAT-1 in glia cells and astrocytes in a manner independent of PPAR-γ activation. Furthermore, PPAR-γ activation may enhance the expression of other members of the SOCS family, such as SOCS-2 and SOCS-3, which could inhibit the JAK/STAT-1 pathway. However, such events remain to be determined. The discrepancy between the work of Park et al. (57) and our current findings might be due to different agonists used, cell types, and inflammatory stimuli. In addition to the direct anti-inflammatory effect of pioglitazone, PPAR-γ activation enhanced the secretion of anti-inflammatory molecules, such as IL-10 (62, 63). We found that pioglitazone alone enhanced basal and LPS-induced IL-10 in macrophages in vitro and in the peritoneal cavity and blood of septic mice. IL-10 is known to decrease TLR responses and, more specifically, MyD88 expression (4), in macrophages. In addition, it was shown that IL-10 inhibits IFN-γ and LPS-induced STAT-1 activation in different cell types (64, 65). Therefore, we speculated that IL-10 is a key component in PPAR-γ’s inhibition of STAT-1 activation and, consequently, MyD88 expression. Our data show that blocking IL-10R action prevents pioglitazone-mediated inhibition of STAT-1 S727 phosphorylation and MyD88 expression. The fact that IL-10 mediates the anti-inflammatory actions of PPAR-γ was demonstrated in different inflammatory models, such as allergic asthma and ischemia–reperfusion (62, 63). However, the molecular programs involved in the IL-10–mediated S727 STAT-1 phosphorylation that further inhibits MyD88 levels remain to be determined. We are currently investigatng the signaling programs involved in PPAR-γ–induced IL-10 production. Our findings suggest the existence of a novel regulatory program elicited by PPAR-γ activation involving IL-10 production that inhibits STAT-1–dependent MyD88 expression. Importantly, changes in MyD88 levels were critical in preventing the cytokine storm, which, in turn, improved animal survival, reduced bacterial load, and reduced neutrophil recruitment to the lungs, all of which are key components involved in sepsis protection. Thus, in view of the fact that pioglitazone is used to treat type 2 diabetes, this drug represents a potential new therapeutic approach to treating the overwhelming inflammatory conditions that are observed in septic patients. We thank Alexandra Medeiros for the critical input. This work was supported by Fundação de Amparo a Pesquisa do Estado de São Paulo, Coordenação de Aperfeiçoamento de Pessoal de Nível Superior, National Institutes of Health Grant HL-103777, and the Ralph W. and Grace M. Showalter Research Trust Fund.
. 2007. Early versus late onset of multiple organ failure is associated with differing patterns of plasma cytokine biomarker expression and outcome after severe trauma. Shock 28: 668–674.
. 2011. MyD88 and Trif signaling play distinct roles in cardiac dysfunction and mortality during endotoxin shock and polymicrobial sepsis. Anesthesiology 115: 555–567.
. 2002. Tissue expression of human Toll-like receptors and differential regulation of Toll-like receptor mRNAs in leukocytes in response to microbes, their products, and cytokines. J. Immunol. 168: 554–561. Dagvadorj, J., Y. Naiki, G. Tumurkhuu, F. Hassan, S. Islam, N. Koide, I. Mori, T. Yoshida, and T. Yokochi. 2008. Interleukin-10 inhibits tumor necrosis factor-alpha production in lipopolysaccharide-stimulated RAW 264.7 cells through reduced MyD88 expression. Innate Immun. 14: 109–115.
. 2011. Distinct protein kinase A anchoring proteins direct prostaglandin E2 modulation of Toll-like receptor signaling in alveolar macrophages. J. Biol. Chem. 286: 8875–8883.
. 2013. PPARγ signaling and metabolism: the good, the bad and the future. Nat. Med. 19: 557–566.
. 2012. Thiazolidinediones and PPARgamma agonists: time for a reassessment. Trends Endocrinol. Metabolism. 23: 205–215.
. 2003. Peroxisome proliferator activator receptor-gamma ligands, 15-deoxy-Delta(12,14)-prostaglandin J2 and ciglitazone, reduce systemic inflammation in polymicrobial sepsis by modulation of signal transduction pathways. J. Immunol. 171: 6827–6837.
. 2008. 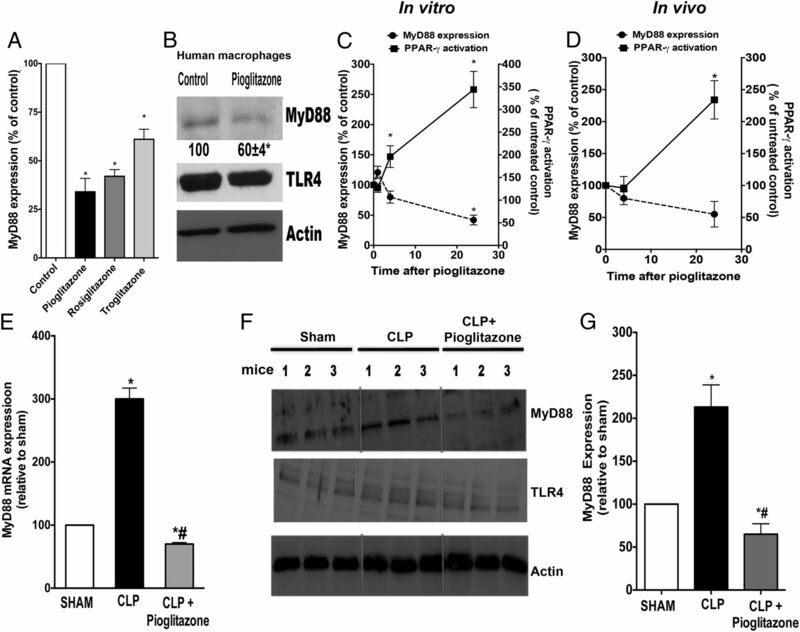 Ciglitazone ameliorates lung inflammation by modulating the inhibitor kappaB protein kinase/nuclear factor-kappaB pathway after hemorrhagic shock. Crit. Care Med. 36: 2849–2857.
. 2005. 15-Deoxy-delta(12,14)-prostaglandin J(2) (15D-PGJ(2)), a peroxisome proliferator activated receptor gamma ligand, reduces tissue leukosequestration and mortality in endotoxic shock. Shock 24: 59–65.
. 2004. Role of peroxisome proliferator-activated receptor-gamma in the protection afforded by 15-deoxydelta12,14 prostaglandin J2 against the multiple organ failure caused by endotoxin. Crit. Care Med. 32: 826–831.
. 2012. Activation of peroxisome proliferator-activated receptor γ by rosiglitazone inhibits lipopolysaccharide-induced release of high mobility group box 1. Mediators Inflamm. 2012: 352807.
. 2010. The nuclear hormone receptor PPARγ as a therapeutic target in major diseases. ScientificWorldJournal 10: 2181–2197. Panzer, U., G. Zahner, U. Wienberg, O. M. Steinmetz, A. Peters, J. E. Turner, H. J. Paust, G. Wolf, R. A. Stahl, and A. Schneider. 2008. 15-deoxy-Delta12,14-prostaglandin J2 inhibits INF-gamma-induced JAK/STAT1 signalling pathway activation and IP-10/CXCL10 expression in mesangial cells. Nephrol. Dial. Transplant. 23: 3776–3785.
. 2012. Inhibition of PPARγ in myeloid-lineage cells induces systemic inflammation, immunosuppression, and tumorigenesis. Blood 119: 115–126.
. 2000. Role of nitric oxide in the failure of neutrophil migration in sepsis. J. Infect. Dis. 182: 214–223.
. 2012. Prostaglandin E2 and the suppression of phagocyte innate immune responses in different organs. Mediators Inflamm. 2012: 327568.
. 2002. Inhibition of leukocyte rolling by nitric oxide during sepsis leads to reduced migration of active microbicidal neutrophils. Infect. Immun. 70: 3602–3610.
. 2010. Phosphoinositide-3 kinase gamma activity contributes to sepsis and organ damage by altering neutrophil recruitment. Am. J. Respir. Crit. Care Med. 182: 762–773.
. 2008. Toll-like receptor 4 mediates cross-talk between peroxisome proliferator-activated receptor gamma and nuclear factor-kappaB in macrophages. Immunology 125: 344–358.
. 2005. Molecular determinants of crosstalk between nuclear receptors and toll-like receptors. Cell 122: 707–721.
. 2012. PPAR gamma activation protects the brain against microvascular dysfunction in sepsis. Microvasc. Res. 84: 218–221.
. 2013. Peroxisome proliferator-activated receptor-γ activation prevents sepsis-related cardiac dysfunction and mortality in mice. Circ. Heart Fail. 6: 550–562.
. 2007. Peroxisome proliferator-activated receptor gamma (PPAR gamma) and sepsis. Arch. Immunol. Ther. Exp. (Warsz.) 55: 19–25.
. 2005. Peroxisome proliferator-activated receptor-gamma is a new therapeutic target in sepsis and inflammation. Shock 23: 393–399.
. 2006. Toll-like receptor 4 signaling leads to neutrophil migration impairment in polymicrobial sepsis. Crit. Care Med. 34: 461–470.
. 2008. The role of neutrophils in severe sepsis. Shock 30(Suppl. 1): 3–9.
. 2009. Regulation of chemokine receptor by Toll-like receptor 2 is critical to neutrophil migration and resistance to polymicrobial sepsis. Proc. Natl. Acad. Sci. USA 106: 4018–4023.
. 2010. Neutrophil paralysis in sepsis. Shock 34(Suppl 1): 15–21.
. 2003. The pathophysiology and treatment of sepsis. N. Engl. J. Med. 348: 138–150.
. 2003. Novel strategies for the treatment of sepsis. Nat. Med. 9: 517–524.
. 2012. Sepsis-induced acute lung injury (ALI) is milder in diabetic rats and correlates with impaired NFkB activation. PLoS ONE 7: e44987.
. 2006. Divergent signaling pathways in phagocytic cells during sepsis. J. Immunol. 177: 1306–1313.
. 2010. IRAK-M regulates chromatin remodeling in lung macrophages during experimental sepsis. PLoS ONE 5: e11145.
. 2011. What the Myddosome structure tells us about the initiation of innate immunity. Trends Immunol. 32: 104–109.
. 2007. The family of five: TIR-domain-containing adaptors in Toll-like receptor signalling. Nat. Rev. Immunol. 7: 353–364.
. 2011. Leukotriene B4 amplifies NF-κB activation in mouse macrophages by reducing SOCS1 inhibition of MyD88 expression. J. Clin. Invest. 121: 671–682. 2012. The JAK-STAT pathway at twenty. Immunity 36: 503–514. 2002. Stats: transcriptional control and biological impact. Nat. Rev. Mol. Cell Biol. 3: 651–662.
. 2000. Serine phosphorylation of STATs. Oncogene 19: 2628–2637.
. 2002. Peroxisome proliferator-activated receptor gamma agonist ligands stimulate a Th2 cytokine response and prevent acute colitis. Inflamm. Bowel Dis. 8: 330–339.
. 2010. Unbalanced M1/M2 phenotype of peripheral blood monocytes in obese diabetic patients: effect of pioglitazone. Diabetes Care 33: e7.
. 2009. Regulatory mechanisms for adipose tissue M1 and M2 macrophages in diet-induced obese mice. Diabetes 58: 2574–2582.
. 2005. The role of pro- and anti-inflammatory responses in silica-induced lung fibrosis. Respir. Res. 6: 112.
. 2009. Thalidomide inhibits lipopolysaccharide-induced tumor necrosis factor-alpha production via down-regulation of MyD88 expression. Innate Immun. 15: 33–41. 2012. New approaches to the study of sepsis. EMBO Mol. Med. 4: 1234–1243.
. 2008. The Sepsis Six: helping patients to survive sepsis. Br. J. Nurs. 17: 16–21. 2002. New solutions for type 2 diabetes mellitus: the role of pioglitazone. Pharmacoeconomics 20(Suppl. 1): 1–9.
. 2011. Novel Therapeutic Agents in Pediatric Sepsis: Peroxisome Proliferator Receptor γ (PPAR γ) Agonists. Open Inflamm. J. 4: 120–124.
. 2011. Peroxisome proliferator-activated receptor γ-induced T cell apoptosis reduces survival during polymicrobial sepsis. Am. J. Respir. Crit. Care Med. 184: 64–74.
. 2012. A historical perspective on sepsis. Am. J. Pathol. 181: 2–7.
. 1994. The American-European Consensus Conference on ARDS. Definitions, mechanisms, relevant outcomes, and clinical trial coordination. Am. J. Respir. Crit. Care Med. 149: 818–824.
. 2003. Effect of 15-deoxy-delta 12,14-prostaglandin J2 on acute lung injury induced by lipopolysaccharide in mice. Eur. J. Pharmacol. 481: 261–269.
. 2012. Toll-like receptor 9 activation in neutrophils impairs chemotaxis and reduces sepsis outcome. Crit. Care Med. 40: 2631–2637.
. 2010. MTA1 coregulator regulates LPS response via MyD88-dependent signaling. J. Biol. Chem. 285: 32787–32792.
. 1990. Nucleotide sequence and expression of a cDNA encoding MyD88, a novel myeloid differentiation primary response gene induced by IL6. Oncogene 5: 1095–1097.
. 2003. 15d-PGJ2 and rosiglitazone suppress Janus kinase-STAT inflammatory signaling through induction of suppressor of cytokine signaling 1 (SOCS1) and SOCS3 in glia. J. Biol. Chem. 278: 14747–14752.
. 2000. Peroxisome proliferator-activated receptor gamma-dependent repression of the inducible nitric oxide synthase gene. Mol. Cell. Biol. 20: 4699–4707.
. 2007. Transcription protein STAT1: biology and relation to cancer. Folia Biol. (Praha) 53: 1–6.
. 2005. Negative regulation of toll-like receptor-mediated immune responses. Nat. Rev. Immunol. 5: 446–458.
. 2003. Suppressors of cytokine signaling and immunity. Nat. Immunol. 4: 1169–1176.
. 2005. Pioglitazone, a specific ligand of peroxisome proliferator-activated receptor-gamma, protects pancreas against acute cerulein-induced pancreatitis. World J. Gastroenterol. 11: 6322–6329.
. 2005. 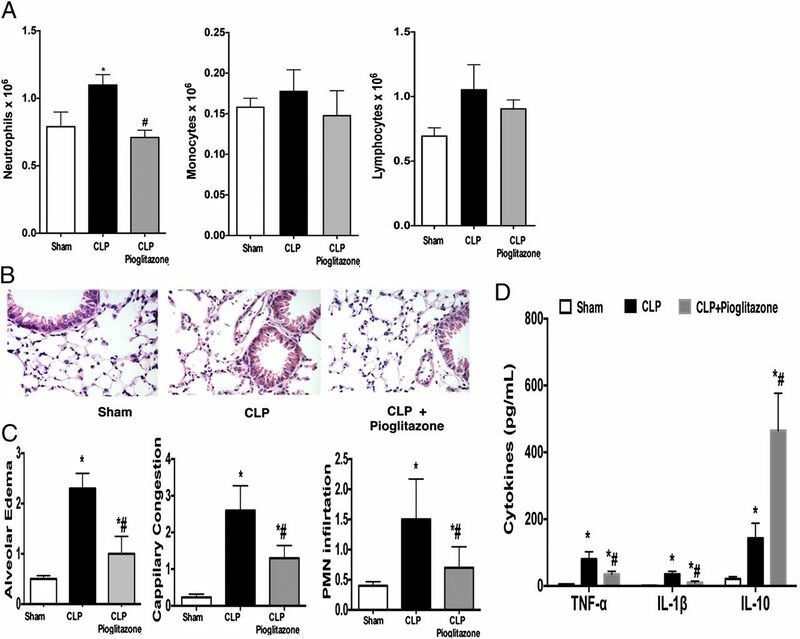 Involvement of IL-10 in peroxisome proliferator-activated receptor gamma-mediated anti-inflammatory response in asthma. Mol. Pharmacol. 68: 1568–1575.
. 2008. Regulation of interferon and Toll-like receptor signaling during macrophage activation by opposing feedforward and feedback inhibition mechanisms. Immunol. Rev. 226: 41–56.
. 2003. Regulation of macrophage activation. Cell. Mol. Life Sci. 60: 2334–2346.